Mystery shopping gives me a lot of windshield time. Recently I had a couple of uninterrupted hours behind the wheel. The sun was rising behind me, the air was crisp, and traffic on the Interstate was light. That's my ideal setting for doing some serious thinking. The topic that morning was "How much am I spending on my car per mile?" 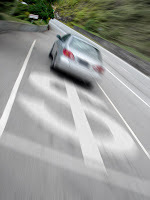 The IRS lets me deduct $0.50 per mile in 2010 from my income. Surely, I thought, the tax man did a lot of research before coming up with this number. But it's not costing me this much. What am I missing? First, I made a couple assumptions. I rounded the purchase price of my 2009 Pontiac G5 up to $13,000. I also decided that if I didn't drive a car, I could earn 6% by investing the $13K instead (conveniently, my car loan has an interest rate of 5.9%). Second, I decided my car will be worthless at 150,000 miles. Fuel: assuming gas averages $2.75/gallon year round and I continue getting 31 mpg, I spend 8.9 cents per mile on fuel. Purchase Price: spreading the cost of the car over its expected life, I spend 8.7 cents per mile on depreciating the cost of the car. Maintenance/Repairs: it's hard to predict what I will spend to maintain my vehicle, but I figure I'll spend $2,500 over 150,000 miles to keep this car running. That's 1.7 cents per mile for maintenance and repairs. Insurance: So far I have averaged 5,000 miles per month, and I pay about $100/mo. for insurance. I spent about 2 cents per mile for insurance. Interest/Opportunity Cost: For this calculation, I simplified things. How much interest would I earn on $13,000 at 6%? I would spend $780/year, or $65/month. Since I average 5,000 miles per month, I spend about 1.3 cents per mile on interest. Adding each of these five areas gives me a per mile cost of 22.6 cents. This is also how I compute my car costs. Here we also pay an annual council tax and vehicle inspection (depending on how old it is). So..this means you´re earning money in your IRS deductions. Here I pay 76.00 E/semester for a third part only insurance. Since I bought my car last year I have kept track of all my vehicle expenses. My current cost per mile is $0.84 but that is with depreciating the entire purchase cost. With a more realistic depreciation my cost would be about $0.28 per mile. I expect that cost to go down as I drive my car more. Mizé - I've had a lot of traffic tickets, but no accidents, so I bet that has something to do with how much I pay. When I was working the six-figure software sales job I was a little cocky behind the wheel, and I was always running late. Now I pay the price of having a lead foot. Andy - I'm really interested in hearing from you over time so that I can compare buying a new car (my plan is to drive it until the wheels fall off) and buying used. I always thought buying used was smart but it will be a fun experiment to see if that's the case for my "buy and hold" scenario.